Brand new to Glencrest Seatex this year, the Golden Care Range of products covers the entire range of cleaning, restoration and protection for outdoor furniture, barbeques and other accessories. In addition and very importantly they are 100% water based, contain no solvents, are non-toxic, non-corrosive and 100% biodegradable, (unlike the greater percentage of competitor products). There are six products in the teak range plus a three in one kit; eighteen in the aluminium, steel, hardstone, glass, resin and wovens range three in the decking and fence range and three in the BBQ range. Cleaner & Brightener in one high concentration cleaner. Returns wood to its original colour. Water-based and solvent-free. Non-hazardous and Eco friendly. 1 Litre. 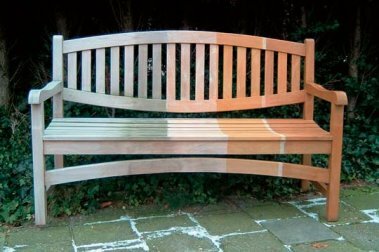 Maintains the colour of teak for longer. Fast and easy to apply. Protector prevents black spots. Not an oil and therefore not greasy. Water-based and solvent-free. Non-hazardous and Eco friendly. 1 Litre. Slows down the weathering process. Turns teak silver / patina grey. Protects the wood against moisture. Protects against adhesion of dirt. Prevents mildew growth. Water-based and solvent-free. Non-hazardous and Eco friendly. 1 Litre. Intensifies and deepens the colour of hardstone. Offers a 'wet-look' effect without a glossy shine. Makes Hardstone repellent to dirt, water and moisture. All products in our Golden Care range are 100% water based. They contain no solvents, are non-toxic, non-corrosive and 100% biodegradable. Fantastic care for both your furniture and the environment! We can provide a product stand for our Golden Care range. See our point of sale section for details.